Also Recommended: Some nonexplicit violence, a healthy bit of fan service, but mostly okay for older children and above. Notes: Based on the Galaxy Fraulein Yuna video game series, in turn based on the MS Girls art works of Mika Akitaka. There is a 3-part sequel that will be treated in a separate review. Ditzy 16-year-old blonde Yuna Kagurazaka is sweet-hearted and makes friends easily, which leads her to win the "Galactic Bishoujo Contest". This, incidentally, makes her the magical girl "Savior of Light", defender of the universe. Fortunately, she won't have to go this alone, as she is able to face all her challenges using the power of love and friendship. 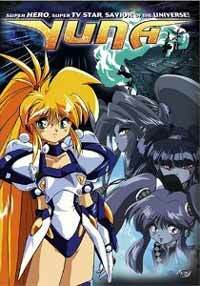 Galaxy Fraulein Yuna was one of the bigger headscratchers back in the salad days of late 90s VHS anime: a two-part OVA series licensed by ADV, given a full subbed-and-dubbed release ... based on a video game series that would never see the light of day in North America. Well, the cover looked cute, and I shelled out the big bucks on the subbed version, way back when. Now, honestly, I'm not sure why this review has taken ten years to see the light of day, but here goes: Galaxy Fraulein Yuna is total, complete fluff, every bit as ditzy as its vacuously blonde waif of a protagonist would imply. It is also adorable, and very, very hard to dislike unless you are a complete and utter curmudgeon or don't care to waste your time on series with little to no psychological depth. It's important to understand here that series creator and veteran mecha designer Mika Akitaka has never been particularly known for creating emotionally deep or complex female leads. This entire franchise was actually based on a quasi fanart / quasi official art series (the MS Girls) in which various Gundams were remade as cute girls in armor in what must be some sort of precursor to the modern-day moe archetype; Yuna in particular was inspired by the Gundam F91 MS Girl model. Now that we've gotten that bit of trivia out of the way, you're probably wondering why you should be even wasting your time on this. Well, frankly, at about an hour's runtime, there's not a whole lot of time to waste, but Yuna is, as far as these sorts of comedies go, somewhat sedate and not as frenetic as what you'd get from a more modern series. A lot of the humor relies on sight gags, which are hit-and-miss, with gluttonous and oh-so-lesbian-for-Yuna android Yuri Cube eating her way out of a waterbed-sized bento being one of the better throwaway scenes - and any scene involving that really slow-moving girl whose name escapes me being not so great. If a lot of the setup is blatantly reminiscent of shows like Sailor Moon, it's no accident; Yuna herself is played by Chisa Yokoyama (Sasami "Pretty Sammy" Masaki Jurai from the Tenchi Muyo franchise / Sakura Shinguji from Sakura Wars) who also provides the theme songs. It's all very lightweight material, and there's not much here to recommend on a technical level due to the age of the series, but there is a certain charm and likability, particularly with the lead, that really helps this hour's worth of fluff go down well. Anyone looking for a deep, insightful plot will be sorely disappointed as there isn't one to find here, just a fairly standard "love and friendship win the day" storyline which may not play to its advantage in a fandom that's gotten used to having psychological drama served up with each new season. But as a time machine to what may have been a simpler era, Yuna has maintained merit simply by dint of being relatively inoffensive and rather entertaining, which is more than I can say for a good many of its contemporaries. Recommended Audience: Some nonexplicit violence, a healthy bit of fan service, but mostly okay for older children and above.